I used to avoid cooking stovetop oatmeal for these reasons, myself. So, I hear you. But, a few years back, I started cooking oatmeal on the stove, and I haven’t looked back. To me, stovetop oatmeal just tastes better. And once you know what you’re doing, you realize, it’s really not that hard or slow. Sure, it’s slower than microwaving a packet. But the benefits outweigh the negatives. 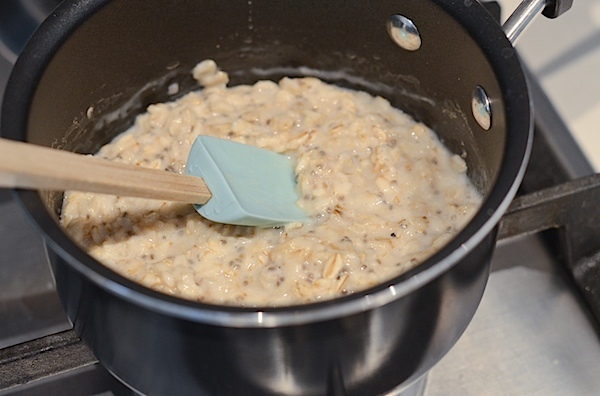 I’m hoping I can convince you to try it too with 5 tips on How to Make Stovetop Oatmeal. Note: This post contains affiliate links. If you make a purchase using these links, I’ll make a small commission at no charge to you. If you have any questions, please feel free to contact me here! Non-Stick: Because oatmeal is pretty sticky, you’ll want to use a non-stick pot. Small: Use a pot that is 1 quart or smaller. If the pot is too big, the oats will spread out and may not cook well. 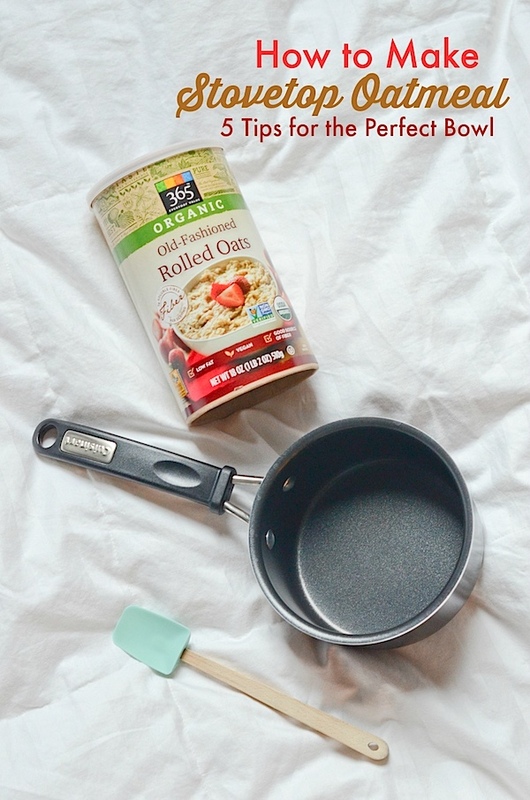 Old-Fashioned Rolled Oats: I prefer old-fashioned rolled oats for my stovetop oatmeal. Steel cut does take too long IMO. Rolled oats can be cooked in around 10 minutes. Quick oats are typically more processed than rolled and don’t give you that nice chewy texture that I find so delicious. I really like Bob’s Red Mill Rolled OatsBob’s Red Mill Old Fashioned Regular Rolled Oats – 32 Ounce (Pack of 4) option here . Bob’s Red Mill Extra Thick Rolled Oats are nice, too. However, these will take longer to cook (and I sometimes find hard oatmeal “shell” pieces when I eat this type). Currently, I’m enjoying the Whole Foods rolled oats, which are giving me a nice, chewy texture. PS: Rolled oats are fun to cook/bake with. They’re really good in my Emergency Cookies recipe – couch to cookies in 20 minutes! Non-dairy milk: I find the non-dairy milks tend to scald less easily than cow milk. You can totally use regular milk, but I’ve found the non-dairy options cook better. Almond milk is my top choice, but I’ve had good luck with soy, rice, and coconut milk, too. Plus, the non-dairy milks can give you new flavor options. How much milk to use? I like one part oats, one part milk, and one part water. So, for example, I’ll combine 1/3 cup rolled oats with 1/3 cup almond milk and 1/3 cup water. 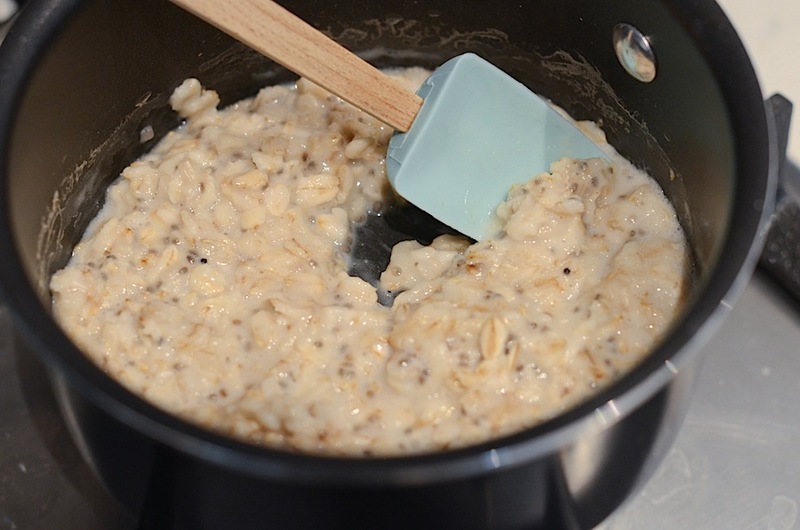 Click here for my Classic Banana Stovetop Oatmeal. I’ll also link up additional Stovetop Oatmeal Recipes at the end of this post. Low: I like to cook my oatmeal on the low setting on the stove. 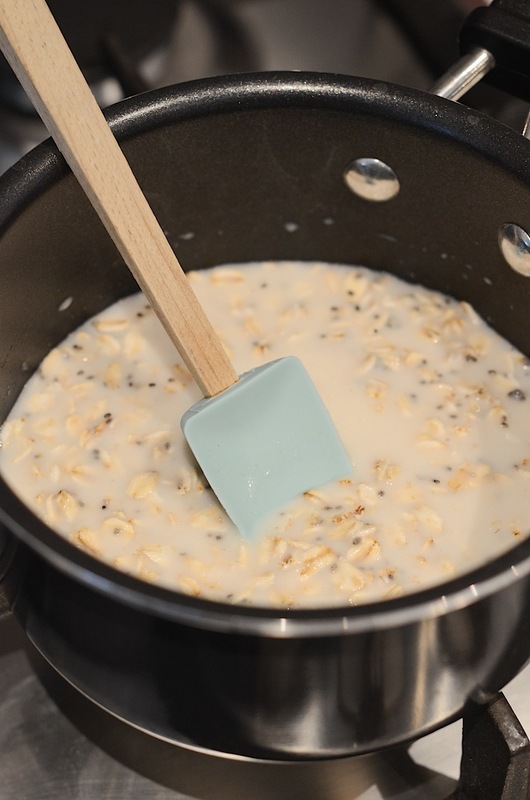 This prevents the milk for scalding and helps keep the oats creamy. Slow: You can probably cook oatmeal faster if you turn the heat up, but be careful that it doesn’t start boiling. A light simmer is okay, but low and slow will give you the nice, creamy texture you’re looking for. Since it’s cooking slowly, I find I only need to stir mine occasionally. The nice thing about oatmeal is that you can cook it to your own texture preference. Some people like their oatmeal more liquid-y and some more thick. If you happen to overcook your oatmeal and it gets too thick, the easy way to fix this is to add in a little more milk. You can use water, but I find using milk helps keep that creamy texture. I took some photos of oatmeal while cooking it stovetop to help give you some visuals on How to Make Stovetop Oatmeal. 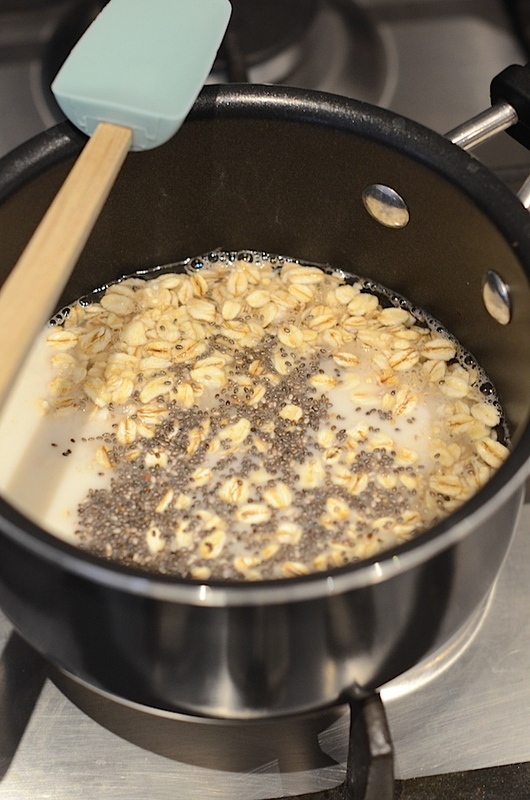 Combine your oats, water, and milk in a pot before turning on the heat. The above just shows them in the pot before stirring. After stirring the oats, the mixture will look like this. Turn the heat to low and cook until the oatmeal is thickened to your liking. See in the above photo how the liquid has reduced? You can cook your oatmeal until it’s as thick as you like. Psst – be sure to scroll to the end for full recipes with step by step details. For me, I don’t like my oatmeal too thick. You can tell when it’s quite thick if when you stir it, it doesn’t spread easily. For example, you can see the bottom of the pan and the oatmeal doesn’t quickly spread to cover it back. If this happens, simply add in a bit of more milk and continue cooking until it’s thickened to your liking. 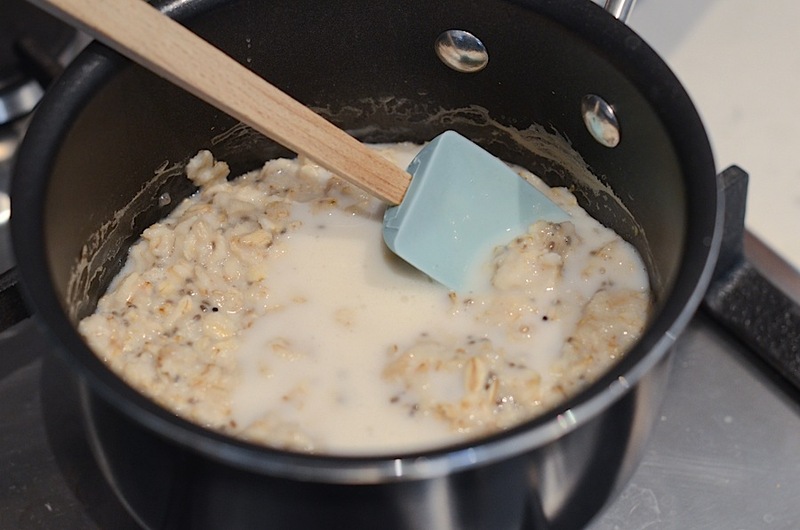 Hope you enjoyed my tips on How to Make Stovetop Oatmeal. Thanks for stopping by!